RICHARD was born, 1197, in the little town of Wyche, eight miles from Worcester, England. He and his elder brother were left orphans when young, and Richard gave up the studies which he loved, to farm his brother’s impoverished estate. His brother, in gratitude for Richard’s successful care, proposed to make over to him all his lands; but he refused both the estate and the offer of a brilliant marriage, to study for the priesthood at Oxford. In 1235 he was appointed, for his learning and piety, chancellor of that University, and afterwards, by St. Edmund of Canterbury, chancellor of his diocese. He stood by that Saint in his long contest with the king, and accompanied him into exile. After St. Edmund’s death Richard returned to England to toil as a simple curate, but was soon elected Bishop of Chichester in preference to the worthless nominee of Henry III. The king in revenge refused to recognize the election, and seized the revenues of the see. Thus Richard found himself fighting the same 1 battle in which St. Edmund had died. He went to Lyons, was there consecrated by Innocent IV. in 1245, and returning to England, in spite of his poverty and the king’s hostility, exercised fully his episcopal rights, and thoroughly reformed his see. After two years his revenues were restored. Young and old loved St. Richard. He gave all he had, and worked miracles, to feed the poor and heal the sick; but when the rights or purity of the Church were concerned he was inexorable. A priest of noble blood polluted his office by sin; Richard deprived him of his benefice, and refused the king’s petition in his favor. On the other hand, when a knight violently put a priest in prison, Richard compelled the knight to walk round the priest’s church with the same log of wood on his neck to which he had chained the priest; and when the burgesses of Lewes tore a criminal from the church and hanged him, Richard made them dig up the body from its unconsecrated grave, and bear it back to the sanctuary they had violated. 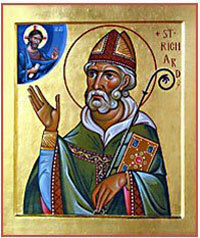 Richard died in 1253, while preaching, at the Pope’s command, a crusade against the Saracens. Reflection.—As a brother, as chancellor, and as bishop, St. Richard faithfully performed each duty of his state without a thought of his own interests. Neglect of duty is the first sign of that self-love which ends with the loss of grace.